Large Knitting Gadget, knits tubes & flat panels fast. 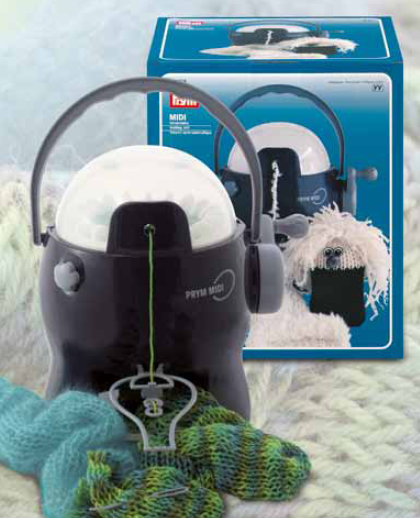 Prym Knitting mill MIDI is a fantastic gadget, it is a quick & easy fun way to knit. The mill knits tubes with a diameter of up to 20cm and flat panels with a width up to 12cm. The mill works well with most hand knitting yarns from a universal 2-6 yarn. Contents include - Knitting mill midi, Crank, Mode switch, Yarn guide, tension piece, Handle, Plastic needle, Lid & Instructions for use. Please note that the mill has been tested and the test sample is in the mill from the factory. There is a pattern leaflet available from Prym to make a scarf with variations, click here for the link if I have it in stock will include this in the parcel. There are more creations available to download at the prym-consumer.com website. Drop a long end of yarn down the middle of mill when you start so you can grab it and place tension on the yarn as it moves through the mill. Slowly turn the handle and watch each latch hook open and close, if one doesn't stop. Use a fine crochet hook or a yarn needle to open and close the hook that doesn't cooperate. I do recommend starting very slowly and pick up speed gradually. Once you have made enough of a square to hold on to and put tension on it, it gets easier because the tension helps the hooks open and close. You will find that different yarns work better than others. Clip on weights could be used throughout but I still recommend using hand at the beginning. For Socks, leg warmers and more. To fit shoe size EU 32-38 UK Adult 0-5.